We are offering a quality range of pig iron and foundry pig iron that is widely used in iron foundries. These are procured from the top notch manufacturers, which ensure optimum quality. We are providing our clients with customized solutions to ensure the efficient and hassle free operations. Our Pig Iron is highly appreciated in the market for smooth yet toughened property. We have carved a niche as one of the flourishing pig iron manufacturers and suppliers based in India. A key intermediate material in the integrated (converter-based) steelmaking process, pig iron is the product of smelting iron ore, coke and limestone in a blast furnace. We are Import & Export of pig iron and steel. Liquid Hot Metal produced through reduction of the Iron Ore in Blast Furnace, using coke as a reductant, fluxes and energy, is cast in moulds leading to production of solidified pieces of Pig Iron having weight of around 8-10 Kg. Pig Iron is used directly in the manufacture of steel. Merchant pig iron is sometimes used as a substitute for scrap in EAF steelmaking, when there is a need to control residuals. Is the fourth most abundant element by weight that makes up the crust of the earth. Pure iron is very reactive to chemicals and corrodes rapidly in moist warm air. 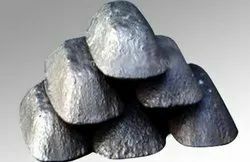 Pig Iron is a form of iron that is impure, it contains about three percent carbon with varying amounts of phosphous, manganese, sulphur and silicon. Basic Pig Iron, PL1, PL2, according to GOST 805-95. 4. Packing: in bulk, without packing.